ABC News interviewed the New Kids on the Block recently to talk about their upcoming tour and more! The New Kids on the Block now date back more than three decades -- and they say in that time a lot has changed, with new digital bridges linking them to their fans. On the other hand, now that they're back together, it also feels like old times. After rocking stadiums in the '80s and '90s, the group -- Jordan and Jonathan Knight, Joey McIntyre, Donnie Wahlberg and Danny Wood -- each went their separate ways. 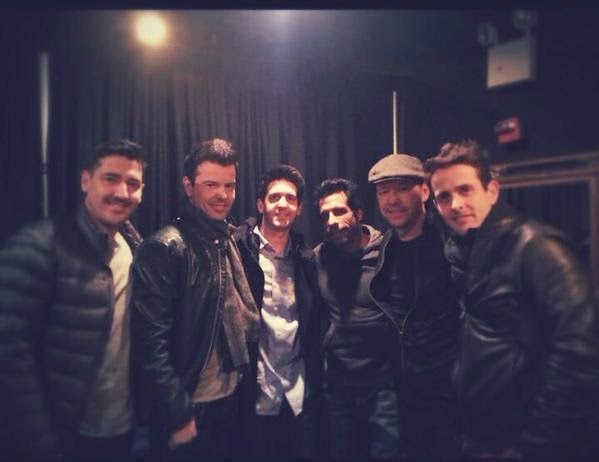 Wahlberg appeared on the big screen, while other members of the band such as Jonathan Knight launched solo careers. The original boy band got back together in 2008 and have been doing their thing ever since. "The whole thing when we got back together was to just have fun," said Wahlberg, 45. "Our fans have fun, so every tour we do, we just try to have an even better time than last time. We are all lucky to be doing this again after all these years." ABC News sat down with the boys at Gramercy Theatre in New York ahead of their "The Main Event" tour, which starts May 1, to see how life on the road has changed in the past 30 years. Joey McIntyre, 42 - "We get to do what we love to do. There's so many life lessons you can get from it, to get better as a person, as a performer when you perform for more than 10,000 people a night. You just want to give them the time of their life. It can be a grind but, again, we keep getting opportunities to see how this can be different for us and that's how we want it to feel for the fans. The minute it gets old, we are not going to do it anymore." Donnie Wahlberg - "Everything is different, the greatest thing about all of this is, in many ways, it's the same. But it's different because we are now doing it again with what we know now. ... The fans are just as awesome, they are just as loud. We showed up again after all these years with all these life lessons, and it's been magical, such a gift to do it differently the second time around. When you get older, things slow down. It slows down and it doesn't whiz by. You are able to appreciate each moment a lot more. We know to stop and smell the roses. Walking into a sold out arena will never get old." Danny Wood, 45 - "During the 15 years we were apart, I never thought my kids would get to see me on stage again. Since 2008, they've been along for the ride, too. That's been another gift that I thought would never happen. They get to come and see me up on stage and these are like their uncles. It's family." Jonathan Knight, 46 - "When we first came on the scene, it was just a whirlwind, almost out of our control. That's how I felt. Now I feel so much more grateful, and now I am able to slow down and enjoy the fans. I can look at people's faces and see their smiles, soak that in instead of thinking of the next thing or how we look. All that negative stuff is gone now. The whole fan experience now, just being in digital age, we can be sitting here right now and tweet and get a reaction. There's so much feedback and I love that part. There's the connection with fans. I'll be lying in bed at 2 a.m. and I'll just turn on Twitter, and I know who's on when I'm up. I love that aspect of it now -- the connection right on your phone." Wahlberg - "Which is saying a lot because Jon was probably the most away from the fans -- him and Jordan in some ways, too, it was a lot for them. For Jon to be saying that all these years later says a lot about him and his journey, but also how much of an impact the digital space has had on us. It's created opportunities for us to connect in different ways. Some of us are the type to go out and hang with the audience and take pics after the show. Some of us are more reserved. But now with Twitter, it's given us a chance to connect in that way." Wood - "And the bonus to that: I have a connection to these guys when I'm away from them. Jon was filming 'The Amazing Race,' Jordan was on his solo tour, Joe with his sitcom, Donnie with "Blue Bloods." With social media, you get bits about them every day." McIntyre - "This tour, I want to show up, have the same amazing experience, but learn to let it go more." Wahlberg - "It only turns into a grind when you lose gratitude. As long as you are grateful, it will just be a wonderful journey." New Kids are teaming up with Cottonelle for a campaign called “Go Cottonelle, Go Commando" before their big tour this summer. According to a news release on the partnership, this campaign is "a larger effort by the toilet paper brand to let people know that only Cottonelle has CleanRipple texture to get you clean, giving you the confidence to go commando." "These wipes will save the Earth," Wahlberg said. "Because when you use these, you don't use as much water." "The Main Event" tour kicks off on Friday, May 1, 2015, in Las Vegas and ends in Buffalo, New York, in July.